“A Camera cannot see what a human eye can see” .I always used to start my conversation with this while discussing about exposure variation. Camera always takes in two different exposures, foreground and background. You generally have to take two pics with different exposures or use a ND filter to make an evenly exposed image. 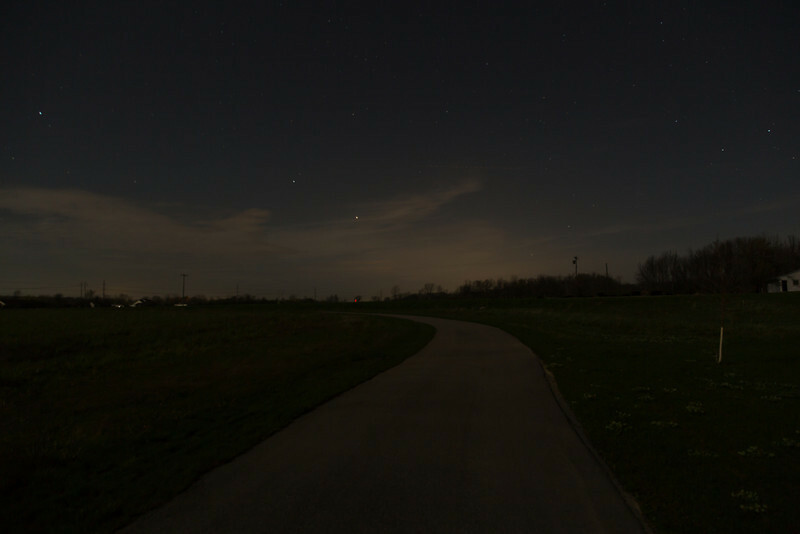 This part becomes bit tricky when you take a night sky with people in foreground. I had this idea in mind for long time that I want to try it out for a couple shoot. Sky Gazing – we all like to sit and watch starts in a clear sky. When you have your partner near your it makes even more magical. 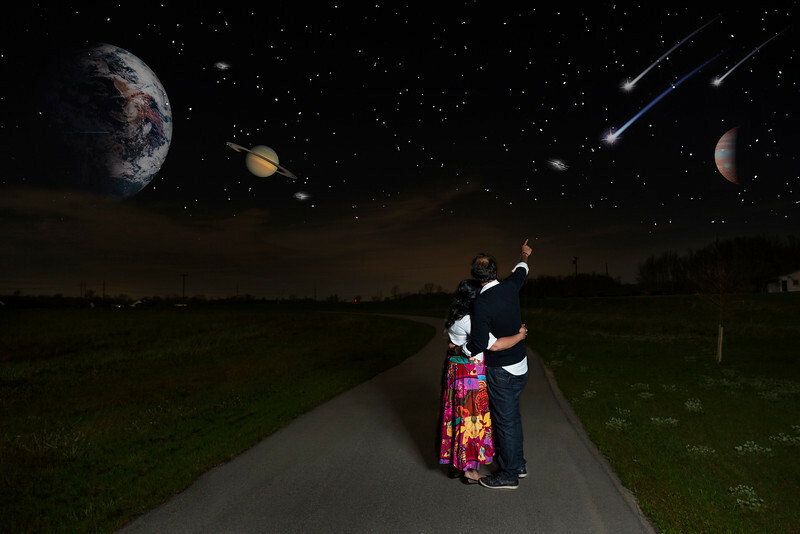 Imagine a sky filled with stars and planets and to add there is showering of shooting stars. The Boy and girl watch this magical event with each other close. This was the basic idea to show the calm and intimacy of a couple for my recent shoot. The problem is, exposure. Generally the stars shots have foreground very much underexposed and most importantly it will be a 30 sec exposure shots. Having a non stable subject likes humans for a 30 sec exposure shots is practically impossible. On Ideal grounds if we want to take this shot ion one go, we should use flash mounted and the exposure will be 30 sec. the subjects in foreground has to stay put for 30 sec. Due to the complex nature of the shot, it is always prudent to take two shots and merge them in Photoshop to get the result. Shot1: This is the shot used for the background for the final image. Needless to say, I used a tripod and a remote shutter release for this shot. Shot 2: This was the tricky shot, I had to place the subject in front and have to lit them using a flash gun. I used soft box to generate a flattering light on the subject. Since it was a pitch dark ambient situation I set the flash to full power and later played with the aperture to adjust the light on the subject. Softbox: Westcott 2334 28-inch Apollo soft box. The trick here is to only light the subject in the foreground and kill all the ambient light as much as possible. Here comes the most interesting and toughest part, post processing. Until the images are brought in to Photoshop and edited, they are only half done and especially when you have a new concept and you are not sure what the outcome will be. The initial steps involved with basic adjustments for the background image, mostly played with curves to make the image right for the background. Then copy pasted the foreground image with subject in the foreground. The reason to kill maximum ambient light is to use the blending mode “Screen” during Photoshop. Screen blending more simply minus the blacks in the image and blend with the lower layer. In other words it just deletes the blacks from the image. When screen blending more is applied the blacks are removed and only the couples are visible. We can now play with the exposure of the couples to blend with the background. Once the background and foreground is in place, its time to add interesting components to the sky. Used the Noise filter and levels to add few bright stars to the sky. Googled an image with shooting star and blended it to the sky as well. Finally Added planets to the sky to make star wars kind of effect. The final image is below.